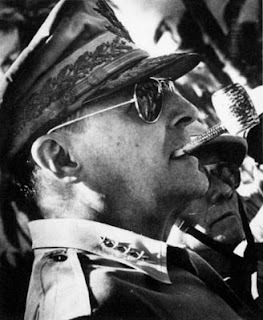 Douglas MacArthur (January 26, 1880 - 5 April 1964) was a general of the United States armed forces, and Field Marshal Philippines. He was Chief of Staff of the U.S. Army in the 1930s and later played an important role in World War II. He was assigned to lead the invasion of Japan in November 1945, and then accept the Japanese surrender to the Allies on 2 September 1945. MacArthur took care of the Japanese occupation from 1945 to 1951 and is credited to implement democratic changes. He led the UN forces in Korea from 1950-1951 against the North Korean invasion. MacArthur removed from office by President Harry S. leader Truman in April 1951 as opposed Truman during the Korean War in public. MacArthur fought in three major wars, World War I, World War II, and the Korean War. This child-wife-while-in-manila1Douglas MacArthur was born in Little Rock, Arkansas in 1880 when his parents were assigned there. His father was a lieutenant-general Arthur MacArthur, Jr.., Recipient of the Medal of Honor, and his mother Mary Pinkney Hardy MacArthur of Norfolk, Virginia. Douglas MacArthur was the grandson of politician Arthur MacArthur, Sr.. He was baptized at Christ Episcopal Church on May 16, 1880. MacArthur's father was assigned in San Antonio, Texas, in 1893. There, Douglas attended the West Texas Military Academy and later the United States Military Academy at West Point in 1898. He graduated in 1903 and was entitled "First Captain Of The Corps Of Cadets". He then went to the Philippines and Japan. this-arthur-MacArthur-iv-anaknya2ini-wife-and-kids-douglas2Ia married to Henrietta Louise Cromwell Brookson on February 14, 1922, and divorced in 1929. He later married Jean Marie Faircloth on 30 April 1937 and were blessed with one son, Arthur, in Manila on February 21, 1938. His son Arthur MacArthur IV.